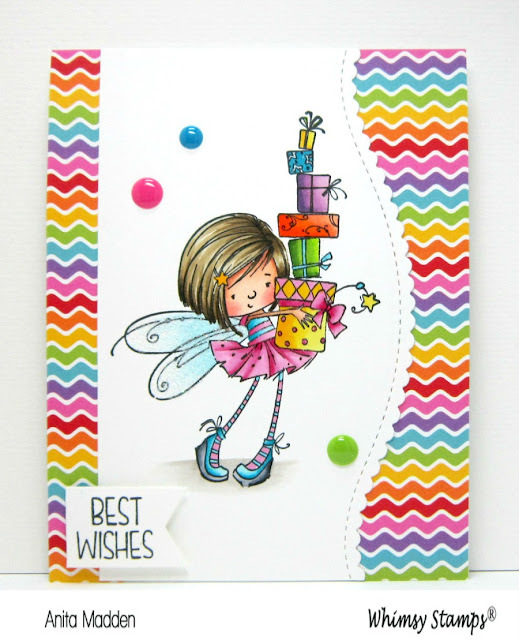 Hello friends, I'm here today sharing another guest designer card for Whimsy Stamps. This sweet stamp is Fairy Gifts For You. I adore this collection of fairies that Whimsy carries. Be sure to stop by their shop to check them out because they're all so adorable! I colored this sweetie with copics and then paired her with some colorful designer paper. Since this is a birthday card I wanted it to be bright and cheery! I added some Glamour Dust to her wings and embellished my card with a few enamel dots. I used my Wink of Stella Clear Glitter Pen to add some sparkle to all of the gifts. The sentiment is from the Polka Dot Fun stamp set. There are lots of sweet sentiments in this set, along with some fabulous polka dots of course!